| A Funny and Topical satire. In War, Inc we find the logical extension of the current outsourcing of all war-related activities we are currently doing in Afghanistan and Iraq. If you are familiar with the antics of Halliburton, Kellogg, Brown & Root and Blackwater overseas you are already halfway home to fully appreciating the satire of Cusack's latest piece. 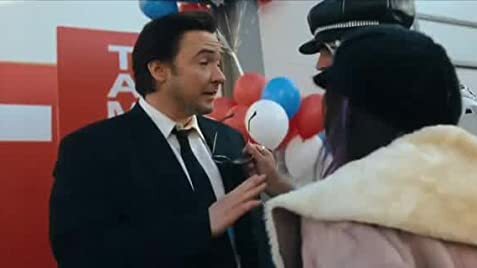 Cusack plays a corporate hit-man named Brand Hauser who finds himself in Turiquistan organizing a trade show in the newly liberated country as his cover while waiting to get access to his latest target. While there he finds himself intrigued by the anti-establishment reporter played by Marisa Tomei and pursued by the over-sexualized pop star played by Hilary Duff. We are introduced to Hauser's past, which includes a tragedy that has haunted him ever since and the corporate assistant named Marsha Dillon who actually is running the entire operation for him (and played hilariously by Joan Cusack). While some moments are played suitably over the top, they aren't always the moments you expect and the little touches often catch you by surprise. All the principals turn in solid performances. Duff's accent comes and goes but otherwise she does a very nice job and goes a long way to dispel her Disney image. Tomei is funny but understated while the Cusack's own nearly every scene they are in. To be fair, they are given good material. The writers turn in a good script with enough twists and turns and visual gags to keep you giggling throughout all the way to the predictable conclusion. In fact, the predictability of the end is the only thing that keeps me from rating it higher as the story twists and turns it's way to the expected conclusion. If you like your comedy broad and physical, there is probably not enough here to keep you interested the entire movie. On the other hand, if you like sly comedy and broad satire, this is for you. The "German Businessman" and his associates that Hauser (John Cusack) kills in the beginning of the movie speak a mixture of gibberish and Bulgarian. The kids he encounters in Fallaf also speak Bulgarian. Brand Hauser: You can't do this. You can't do this. I won't let you. I'm your father. Brand Hauser: It's me. I've loved you since the day you were born. Hauser has his dry cleaning delivered from "Laundry Unit Rammstein" in Germany. The German town - and the name of the real-life Air Force base - is spelled "Ramstein". BeTolerant.com is listed twice in the thanks section of the credits, despite this resulting in an odd number of entries and causing the last entry to have to go against the rest of the layout (centered, vs two-column) to keep things even.